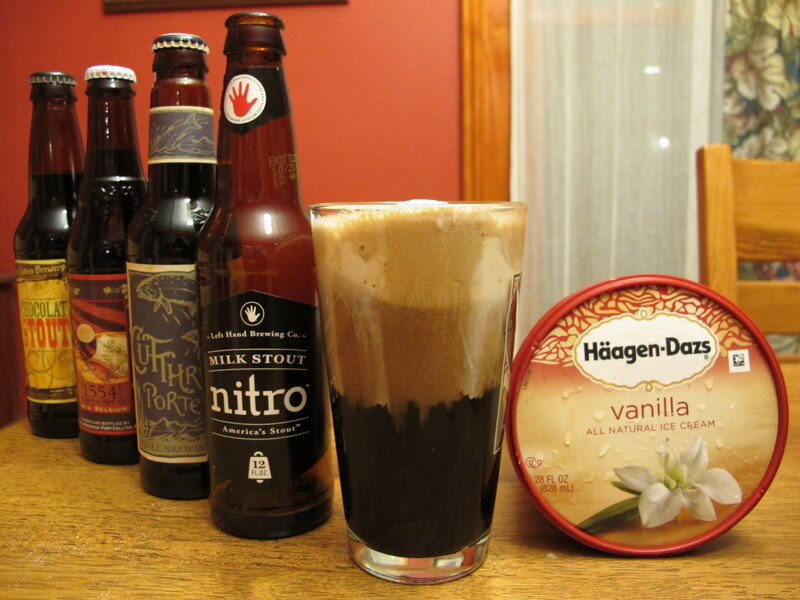 Beer Floats: a new twist on the age old pairing of milk and alcohol. For the majority of human history people have not had access to reliable systems of refrigeration. Dairy products were usually converted into “milk storage units”, processed into yogurt, cheese, or cultured cream or butter to give milk a longer shelf life. Fresh milk was used on farms, but rarely transported and in hot climates was usually consumed after it had been processed or cooked in a dish. In Africa, India, the Middle East and South East Asia fresh cheeses like paneer and feta, cultured or clarified butter, fresh or strained yogurt, also known as curd, and puddings flavored with sugar, saffron, pistachios or rose water are all integral components of these hot climate cuisines. Many of these dairy preparations break up (pre-digest, if you will) the long sugar chain in milk – lactose – of which some people form an intolerance to during their life. In the cooler climes of Northern Europe refrigeration did not pose as significant a challenge and there are a number of recipes from the first printed cookbooks that contain fresh dairy products. Historically Northern Europeans also had a very different relationship to their food than we have today. Fats were desired, not only as a form of calories for hard working bodies, but also to maintain health. Fat-soluble vitamins need to be digested in the presence of fat for the body to absorb them. Even current research on fats, like the Omega-3 fats and conjugated linoleic acids (both present in dairy products form grass fed cattle) are shown to be heart healthy and CLA has also been found to be a potent anti-carcinogen. Dairy products provided not only health benefits, but surely must have been prized as the most delicious foods in a person’s pantry. After having worked at a Windsor Dairy, a raw milk, grass-fed, organic dairy, I know the unsurpassed flavor and rich texture of dairy products that everyone from peasants to royalty enjoyed for the majority of human history until grain fed diary products and pasteurization, homogenization, and varying percentages of milk fat became commonplace in 1900’s. In my next blog I will discuss the history of the “cholesterol scare” and the debate over milk and heart disease. But for now, enjoy the holiday season with a delicious dairy splurge here and there. The following recipes I found interesting as food histories and flavor combinations. In this past month’s New Yorker Food Issue the article, “The King’s Meal: A Popularizing Historian Cooks Up the Past” introduced readers to Dr. Lucy Worsley which the article described as, “an unembarrassed disciple of a school of history known as experimental archeology – or as she calls it, ‘dressing up and trying things out’ – which uses artifacts to channel the physical experience of everyday life in another era.” The article described a recent attempt to recreate a meal that King George III ate on the evening of February 6th, 1789. 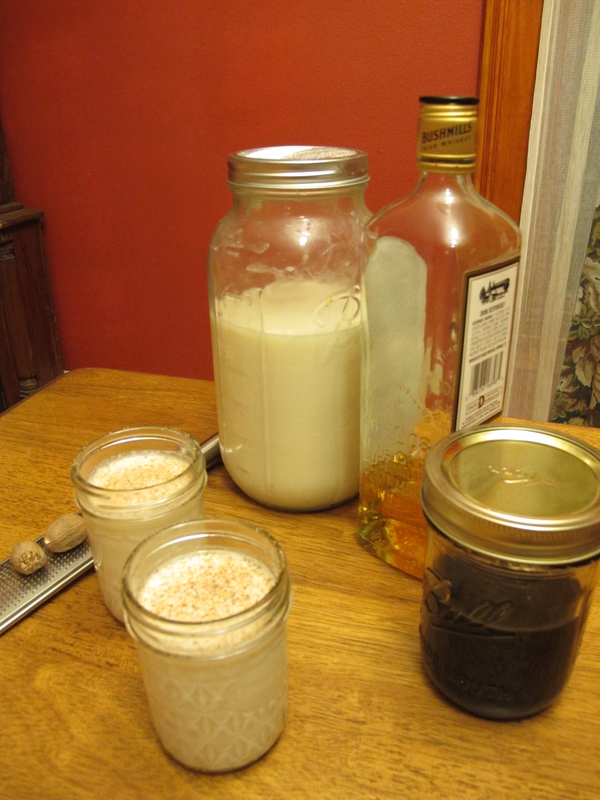 In the spirit of experimental archeology I’ve included some recipes from the past that can be served during the holidays – many of them include alcohol to grease the wheels of any holiday gathering. I’ve also included easy versions of these recipes with a modern twist. 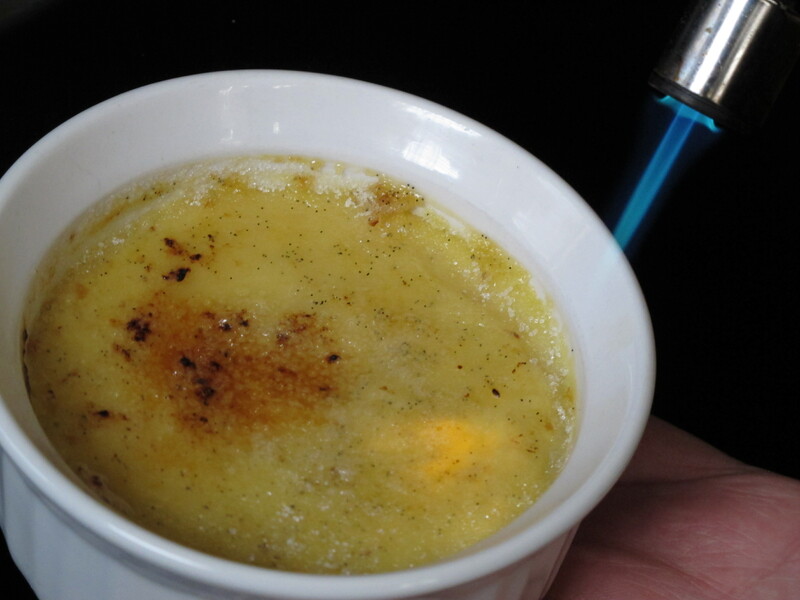 The last recipe is my go to Crème Brulee recipe, one of the best desserts I’ve eaten anywhere. It is fun to bring to a party where everyone can burn their own sugar crust if you pass the torch around (and worth purchasing a torch if you don’t have one). All of these recipes will benefit from the use of high quality dairy products. If you don’t have a local dairy, Organic Valley products are the highest quality dairy products in the supermarket. When you buy Organic Valley products you support family farmers that do not farm with chemicals and have higher animal welfare standards than USDA certified organic standards. 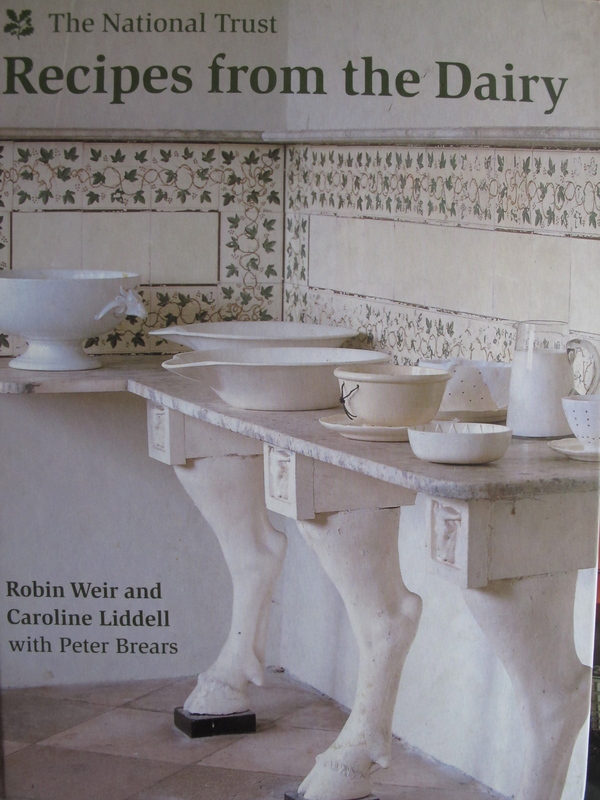 The following two recipes are from the National Trust’s book Recipes from the Dairy by Robin Weir and Caroline Liddell with Peter Brears, which gives an extensive look into the history of dairy products in England. This book has an enjoyable section on the history of ice cream and offers extensive information on the history of royal dairies and some very interesting recipes that are all but forgotten, like the recipes for syllabub I’ve posted here with text from the book. Apparently, syllabub was originally made by milking the cow directly into a bowl of cider, wine or verjuice. However, recent experiments by Ivan Day, with the help of an obliging cow, have confirmed that either tastes have changed considerably since the seventeenth and eighteenth centuries or many of the recipe writers had never tried the recipe. As recipe plagiarism was rife at that time, this may well have been the case. Helen McKearin writing in The Glass Circle (issue no. 5) analysed 167 different recipes from 1655 to 1865 and found many were faithful repearts of the same one. Syllabub, however, divides into two basic types – simple, and everlasting or whipped. The basis of syllabub is that an acid – cider, ale, wine, verjuice (or other acidic liquid) – is added to milk or cream. This causes it to curdle and separate. With simple syllabubs, the liquid would e drink and the curdled cream (which was usually sweetened with sugar and sometimes flavored) would float on the top to be eaten with a spoon. With everlasting syllabubs, they do not separate, and many more exotic colors, flavors and perfumes were used to flavor them, including fruit juices, flower waters, cloves, ambergris, musk and perfumed comfits. There were many designs of syllabub glasses. Some had spouts and were similar to posset pots; they are now highly sought after by collectors. Syllabub was also frequently served in jelly glasses. There is still much discussion about the use of these various types of glass. This recipe is from John Nott’s The Cooks and Confectioner’s Dictionary, published in London in 1733. Dissolve the sugar completely in a small amount of boiled water and allow to cool completely. Pour the cider into a bowl and add the sugar syrup and some grated nutmeg. Add the cream and stir, then leave to separate for about 2 hours in a cool place. Lift the lid off the curdled cream with a skimmer, pour the liquid into tall glasses, then carefully lay the curdled cream on top of the liquid. Why syllabubs are almost never seen on menus today is a mystery. It is the ideal dessert as it is easy to make and keeps for 4-5 days in a refrigerator. Inexplicably, the only one we have found at a restaurant in the last five years was simply not worth eating. It is one of the finest English desserts and a revival of syllabubs is long overdue. We have tried many recipes and think that this one is the best. Peel the skin from the lemon, making sure that none of the white pith is attaches. Put this with the sugar, wine or cider, plus brandy, Madeira or sherry, in a bowl, and allow to marinate overnight. The following day remove the peel and add the cream slowly, while whisking continuously until the mixture will hold soft peaks. Take great care not to overbeat if using mechanical whisks; if in doubt use a balloon whisk and do it by hand. Transfer to tall glasses of about ¼ cup capacity and fill them to the brim. Grate a little nutmeg on the top and keep at least 6 hours or overnight in the fridge before serving. Decorate with a sprig of rosemary or a twist of lemon peel. 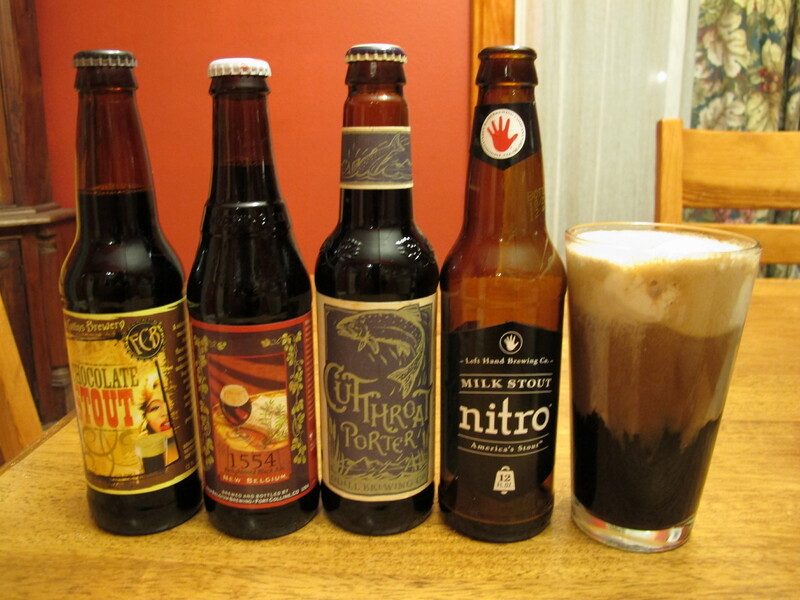 Colorado stouts and porters left to right: Fort Collins Brewery’s Chocolate Stout, New Belgium Brewery’s 1554, Odell’s Cutthroat Porter and (my favorite) Left Hand Brewery’s Nitro Milk Stout. Maybe syllabub did not die out but evolved into this modern dessert novelty. I live in Fort Collin’s Colorado which is a micro-brewed beer Mecca. Home of New Belgium beer and several other top breweries I have heard Fort Collins described as the Napa Valley of beer. This paring of beer and ice cream appears on many dessert menus in town for good reason. A dark beer and vanilla ice cream are a delicious pairing indeed. For a low fat take on syllabub celebrity chef Nigella Lawson uses Greek yogurt whipped with honey, a generous amount of orange peel, a pinch of cinnamon, and a modest amount of red wine to serve over luscious fruits like figs or berries. High in vitamin C and antioxidants this might also prevent the onset of a cold. This book by food writer Anne Mendelson is a love letter to dairy products. 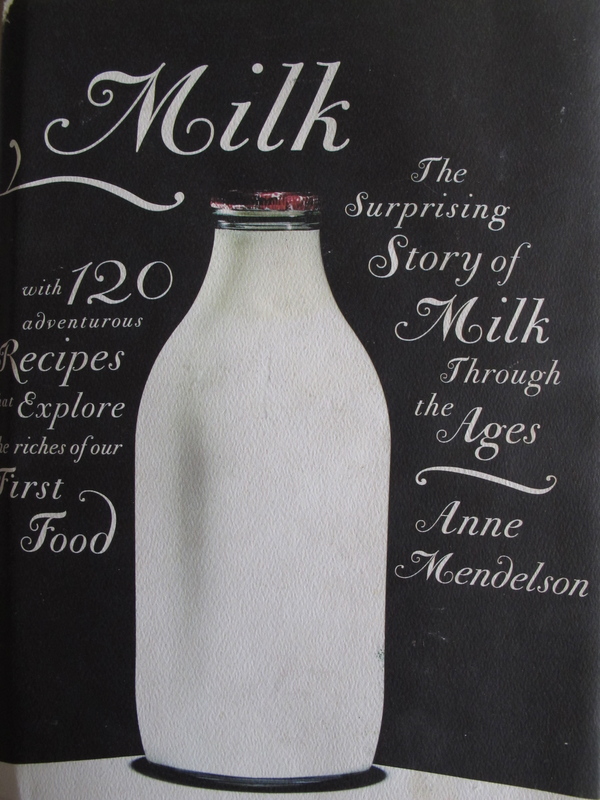 The following recipes are from the book, Milk: The Surprising Story of Milk Through the Ages (with 120 Adventerous Recipes That Explore the Riches of our First Food) by Anne Mendelson. Mendelson is a food writer, historian, and an advocate for high quality dairy products from family farms or “micro-creameries”. Her book Milk is a fascinating lesson in food history and a love letter to dairy products. Most versions that I’ve encountered are cold, and involve separately beaten egg yolks and whites as well as whipped cream. You beat the yolks with sugar and booze (usually bourbon, Scotch, brandy, or rum) before adding the whipped egg whites and cream, which create a thick frothy topping. Some lily gilders also add more sweetening via a block (or individual dabs per serving) of vanilla ice cream, which gradually melts into the rest of the drink. I confess that I have lost the taste for cold, very sweet, frothy eggnog. I like it warm or hot, straightforwardly creamy, and offset by something astringent. To those who share my opinion I offer this version of the north German Hoppelpoppel, closely taken from Horst Scharfenberg’s lovely book Die deutsche Küche. (To the bewilderment of non-Germans “Hoppelpoppel” can also refer to a dish of fried eggs and potatoes.) Its starting point is strong brewed tea sweetened with Kaniszucker, or lump sugar. Use the French A la Perruche lump sugar if you can get it. Mix the tea and sugar until the sugar is completely dissolved. Whisk the egg yolks smooth (not frothy), then whisk in the cream and the sweetened tea. Strain into the top of a double boiler set over hot water on low heat. Whisking constantly, warm the mixture until it is hot and slightly thickened. Carefully stir in the rum and serve at once in heatproof punch cups or demitasse cups. Variation: Some people make Hoppelpoppel with black coffee instead of tea. Nutmeg, Milk, Whiskey, and Homemade Simple Syrup (equal parts evaporated cane sugar and water) create a simple and festive holiday beverage. The star chemistry between milk and liquor used to be common knowledge, and deserves to be so again. Not just milk reinforced with eggs and cream to make eggnog; not just the industrially concentrated canned milk that goes into many Latin American holiday drinks. Given a little sugar and spice, plain old milk is a delightful partner for brandy, rum, whiskey, sherry, and nearly anything that gees into other sorts or punch. Briefly beat or whisk the cold milk in a small bar pitcher and add the optional crea. Stir in the syrup and liquor and pour into punch cups or small tumblers. Grate the nutmeg over the top and serve at once. To produce the delightful hard surface that crackles when tapped with a spoon, you will need to brown the sugared tops of the custards with a small kitchen blowtorch, available at most specialty gourmet stores. Preheat oven to 325° F. Place four 6 ounce ramekins in a large baking pan lined with a kitchen towel. Bring a large pot of water to boil, and keep hot until ready to use. In a small saucepan, heat cream, vanilla bean, and scrapings over medium heat until bubbles form around the edges and the mixture starts to steam. Turn off heat. In a large bowl, whisk together ½ cup sugar and egg yolks until combined and the mixture becomes a pale lemon yellow color. Whisking constantly, slowly add hot cream mixture. Strain mixture through a fine sieve into a clean bowl, skim off any surface foam with a spoon. Pour custard into ramekins, Carefully pour the boiling water into baking pan until it reaches halfway up sides of ramekins. Bake until custard is just set in the center when gently touched with your finger, about 35 minutes. Transfer ramekins to a wire rack to cool. Cover with plastic wrap, and place in refrigerator to chill completely, 2 to 3 hours or overnight. Transfer to freezer 45 minutes before serving. Remove from freezer, and sprinkle enough sugar to coat the entire surface of custard over each. (It does not have to be thick). Using a kitchen torch, pass the flame in a circular motion 1 to 2 inches above the surface of each until the sugar bubbles, turns amber, and forms a smooth surface. Serve immediately. 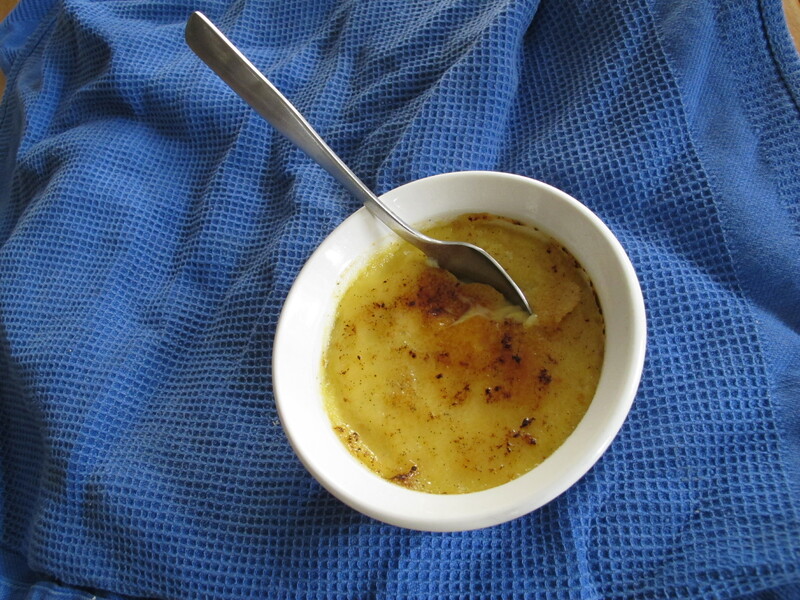 Puddings, like the custard in creme brulee have been made for centuries for celebrations or to use excess milk. Happy eating (and drinking) and happy holidays. This entry was posted in United States and tagged Healthy Fats, Raw milk, Windsor Dairy, Winter Holiday Dairy Recipes. Bookmark the permalink. It’s nice to see recipes that do not apologize for using whole, rich dairy. It’s such a scam that Americans think skim milk is actually good for them. These recipes look awesome. I get my milk from Windsor and I just made a beer float with some homemade vanilla ice cream and a left hand milk stout… Heaven!!! Thanks for the recipes. Cheers.